Engraved Set of 6 Silver Plated Red Roses and Glass Swarovski Crystal Vase Gift Set. 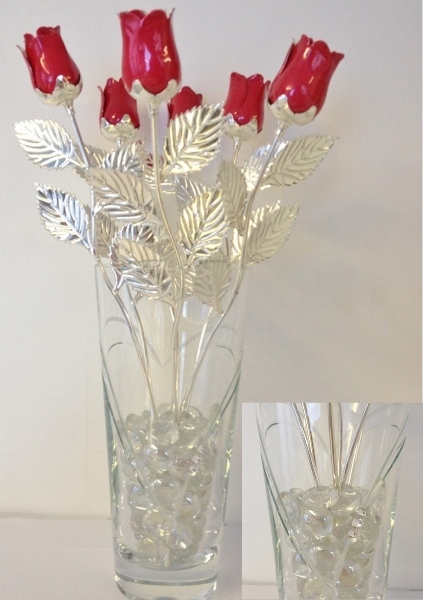 This amazing gift set comprises of 6 Silver Plated Red Roses, clear glass beads and a Swarovski Crystal Vase. Each rose comes presented in it's own black gift box. The personalisation will be engraved onto the front of the Swarovski Crystal Vase. A truly unique gift for that special occasions. Perfect for gift for an Anniversary, Mother's Day, Valentines Day, Birthday, Christmas.....it's endless!